Wilson ‘s Camps: Salmon and hospitality on New Brunswick ‘s Miramichi River. “I’ll get you ready…” said our guide, Lloyd Lyons, as he left me waist deep in Buttermilk Pool and headed toward the bank. Sure, he probably says that to all his clients, but I cast again, more confident that the odds were slowly turning in my favor. 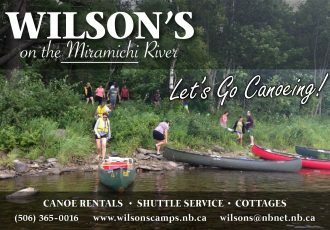 My wife and I were halfway through our second day at Wilson ‘s Sporting Camps on the banks of the Miramichi River , in New Brunswick , one of the world’s top Atlantic salmon rivers. And not only had I not hooked into one of those silver beauties, but I saw them all around me, which, as anyone who has fished for Atlantic salmon will tell you, is far worse than not seeing them. “They’re just more showy in the fall,” Lloyd would say as I pointed to another splash or roll. “Keep casting.” I had faith in this man. After all, he had helped another husband-and-wife team land a pair of 25-pounders just a few days before – a fruitful haul, I am later told, for a week of fall salmon fishing. In contrast with the relaxed, family atmosphere of the lodge itself, salmon fishing at Wilson ‘s Sporting Camps is serious business. Keith Wilson, fourth-generation owner, expects all sports to be ready for a full day on the river. And he should know; the Wilson family settled this land 200 years ago and has been in the fishing biz longer than any in the area – nearly 150 years of outfitting, the last 75 years as a full-bore lodge. And as Keith is quick to confirm, with commercial netting on the river nothing more than a distant bad memory, salmon fishing on the Miramichi is in bullish form. On our first morning, as a guide Lloyd, equal parts Clint Eastwood and Buddy Ebsen, poked around in my fly box, I asked him about local patterns. “Well, any combination of the Undertaker-Preacher-Bradford works well. Then there’s the Rusty Rat, the Green Machine, some shrimp patterns, of and bombers’ll do the job,” he broke off, pulling his specs to the tip of his nose and peering at an orange concoction on which I will later catch two fair-size brookies. “Course, that lady from California ,” he said, eyeing me briefly, “got her 26-pounder yesterday on some sort of little brindle bug – a steelhead fly her husband tied.” I nodded. Who am I to argue with success? Thankfully, the brookies aimed to please and we each managed to hook a couple of two- to three-pounders – mere teasers, according to Lloyd, the Irrepressible, though he was quick to point out that we should return just after ice-out. “Those black salmon really move in April. And they’re hungry,” he said, referring to the dark color the Atlantics take on after a winter of privation. Opening on April 15, the season sees wild Atlantic salmon fresh from their inland spawning exploits latterly teeming downriver, and ready for action. This frenzy mellows into steady, dependable fishing, with some slowdowns, depending on water levels and temperatures, throughout the season. Yet even at the peak of spring salmon action, there is no crowding at Wilson ‘s five-mile stretch of the river. At any one time, though there are seven well-appointed cabins, you won’t find more than ten rods per day on Wilson ‘s 16 private pools. “One of the things we’re known for is our no-crowding policy,” says Keith, emphasizing that rotation only results in frustrated anglers and lower guest-return rates. It’s this sort of concern for the customer that continues to set Wilson ‘s apart from the crowd. Their famed hospitality is fondly remembered by guests the world over. In addition to nearly 100 years of Miramichi salmon photos and memorabilia that line the dining room walls, the fare served is hearty, confidence-building comfort food. Breakfast’s grainy cereals, tangy local sausages and bacons as well as the best pancakes I’ve ever had – moist, fluffy, and many – segue into hot shore lunches prepared by the guides over open fires; salmon, burgers, soups, desserts and robust coffee are the order of the (mid)day. And evening meals are cherished events at Wilson’s, often beginning with Keith’s mom’s award winning cream of fiddlehead soup, and working through hearty servings of crisp green salad, broiled salmon with Hollandaise sauce, fresh green peas, homemade rolls and real mashed potatoes, followed by meringue-topped pies, both lemon and butterscotch – all made from scratch that day by Wendy Murphy and Patricia Price, Wilson’s veterans of 15 years. The two days we spent at Wilson ‘s were the last of the year for New Brunswick ‘s salmon season, but even so, the camp was full and the fish were there. And though the action was frustratingly typical for fall – slow, but nonetheless thrilling to me as I stood in the middle of the Miramichi, experiencing fall foliage ablaze, salmon jumping every few seconds and not another soul in sight – how could anyone complain?